Welcome to the dan330.com page for S’mores. With our large section on Minnesota Tourism, Food, and Tailgating, we just can’t pass up writing about Smores. 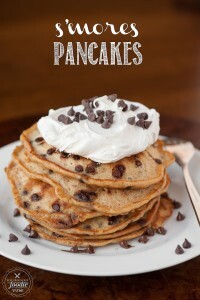 They are probably the top campfire dessert, and can be adapted in so many ways. We are dedicating this page as your new Smores hub. Come here for everything Smores realted. You are going to fall in love with this ooey gooey sticky sweet treat! Don’t forget to stay up to date with us on Facebook, YouTube, Pinterest or Twitter. If you want to get behind the scenes with us, join us on Periscope! For even more tailgating recipe ideas, you can check out our tailgating recipes page here. Links to all of our recipes are at the bottom of this post. Growing up in Minnesota, we have snowmobiles, drinking fountains, play duck duck grey duck, and roast Smores over campfires. Sometimes it is all I can take to think that the rest of the country only gets Smores right. 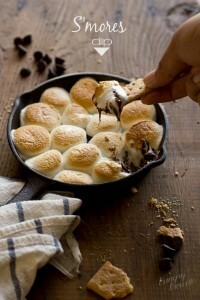 But anyway, Smores are a campfire dessert that consists of a cracker, chocolate, and roasted marshmallows. Many people have adapted these recipes and fused them into their own recipes so there are many different versions today. The traditional recipe includes Gram Crackers, Hershey’s Chocolate, and Marshmallow. To make one, simply roast your marshmallow. When it is ready to be cooked, break a graham cracker in two, placing the chocolate and marshmallow inside. Squeeze the cracker pulling the marshmallow off of the roasting stick. Today, there are several popular variations including Smore Bars, Brownies, Cake, and Pie. 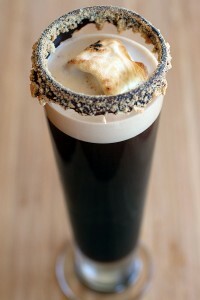 We even made a Smores Beer. You can check that out later. As with any serious topic, there is dissension. When it comes to Smores, it is clear there is a great schism between the golden brown and the burnt marshmallow crowd. When you are making Smores for other people, make sure you know what camp they are in!!! A modern twist on this historic debate: It seems as thought the debate has gotten a little more complicated in recent decades. The indoor Smore has complicated things by offering even another way of cooking your marshmallows. There are three primary ways of cooking an indoor smore but any place where there is heat could work. The microwave, oven, and a gas stove all work. Trust me, sticking them in a toaster DOES NOT WORK. Someday, when I have a toaster I can destroy, I will write a post on this for you. The oven and the stove – Both an oven and a stove use heat to melt and caramelize the marshmallow to a golden brown. These are the closest thing to a wood fire. But they don’t have the same radiant heat that coals have and you won’t get the smoky flavor either. Microwave – If you put a marshmallow in a microwave, it will get hot, grow very large, and melt, making your microwave a very big sticky mess if you don’t watch it. A microwave will not brown the marshmallow either … leading to the third type of finished marshmallow in the great debate: The melted, all white marshmallow. I actually have a friend that prefers this, but it is mostly a result of lazy people who don’t want to make a fire or wait for the oven to heat up. This campfire dessert is so popular, there is even a day each year that celebrates these tasty treats. Can’t believe it? You can read more about it here: http://holidayinsights.com/other/smoresday.htm.